Last Friday, senior midfielder Mariah Nogueira was named Pac-12 Scholar-Athlete of the Year and joined fellow seniors defender Alina Garciamendez and defender Rachel Quon on the National Soccer Coaches Association of America’s (NSCAA) All-America teams. Quon and Garciamendez were both named first-team All-Americans, while Nogueira was listed on the second team. Though top-ranked Stanford lost its NCAA College Cup semifinal 1-0 in double overtime to North Carolina on Friday to miss out on a chance to defend last year’s national title, this trio of four-year starters and team captains can look back at a successful spell on the Farm. Garciamendez played in a total of 102 games for Stanford, starting every single match in her collegiate career to become the only player in school history to reach the century mark. 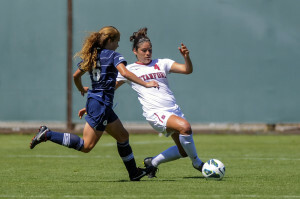 Nogueira was Stanford’s second highest goal scorer this season, with a personal season record of seven goals that took her collegiate total to 21. Quon has the team’s third highest assist ratio this year, and though her record of three goals this year is significantly lower than Nogueira’s seven and Garciamendez’s six, it was her strike that sealed a comeback win over No. 2 UCLA in L.A. on Oct. 28.